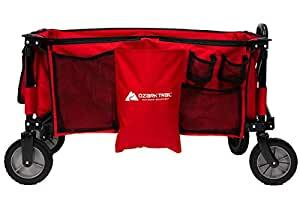 This Ozark Trail Folding Wagon is perfect for hauling all your essentials around the campsite. Built with a durable steel frame and double layer polyester fabric, it can handle up to 225 lbs. You can easily guide your load with an ergonomic handle that telescopes to where you need it. And when the job’s done, the whole wagon folds down to a compact size with the organizer wrap doubling as the carry bag. It’ll fit into your car trunk with plenty of room to spare.